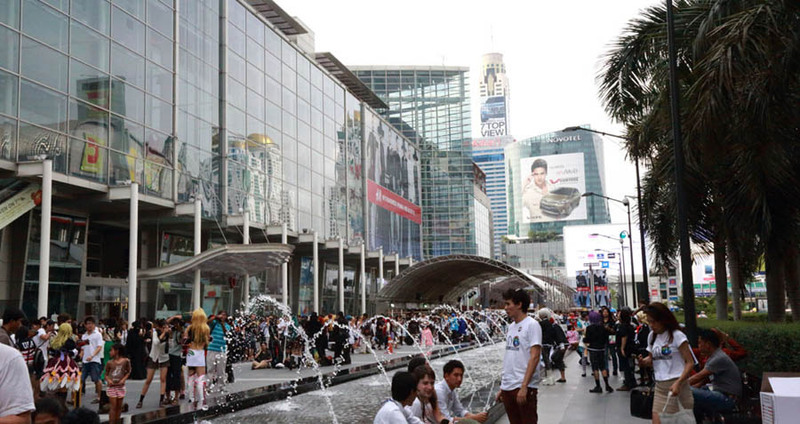 The giant shopping center in Bangkok, Central World ! They call it not shopping center but shopping complex. 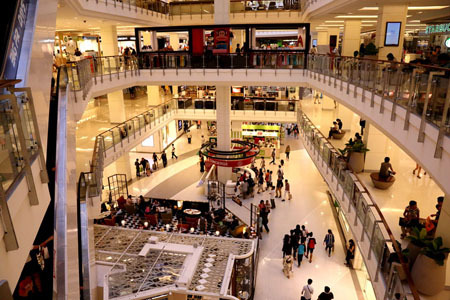 It's the largest shopping complex in Bangkok and the sixth in the world. 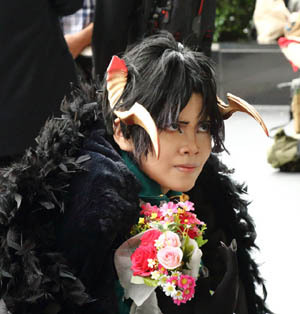 This picture above was taken when JapanFesta in Bangkok 2013 was held. It has ZEN department store on the left, a seven-level trendy lifestyle megastore not only for young people but for all family members and ISETAN on the right, a Japanese department store based in Shinjuku, Tokyo. 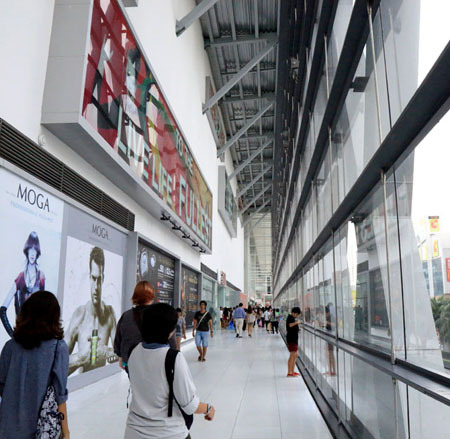 Maybe, I guess, when men (who are not good at shopping) visit here, they will lose their way while crying, have no idea of where to go because it's unbelievably wide. I recommend you check their websites beforehand if you don't go shopping so often. 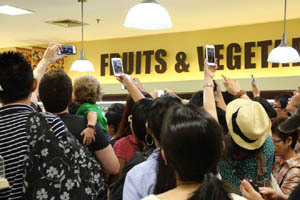 BigC, the popular supermarket for daily life across the street. Don't have a bird ! 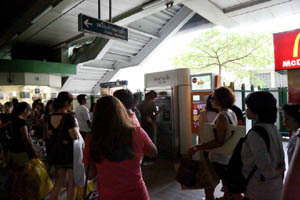 A narration runs automatically. 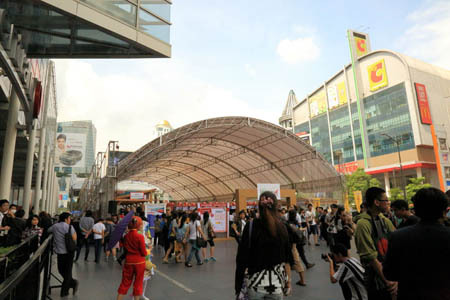 You can visit this CentralWorld by BTS SkyTrain: get off Siam or Chit rom station, then walk for several minutes on a pedestrian way called "Skywalk" connecting the stations and Central World. 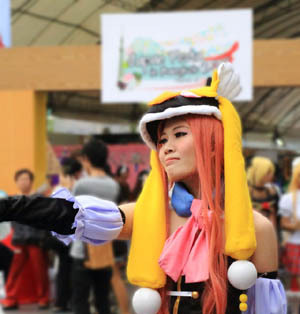 When I went there last time, Japan Festa in Bangkok 2013 was being held. This page shows pictures mainly of the event. Now, here we go ! 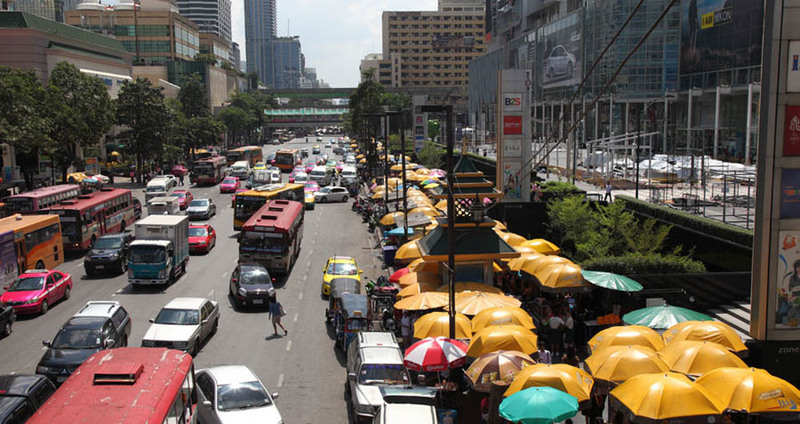 CentralWorld - Let's go to CentralWorld ! 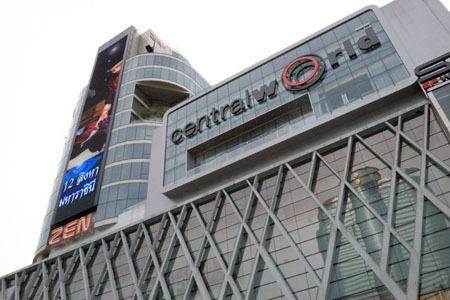 CentralWorld - Power Spots ! 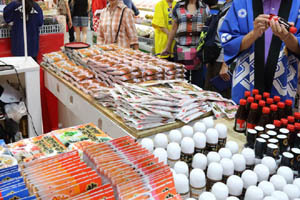 Japan Festa - Hokkaido Fair ! 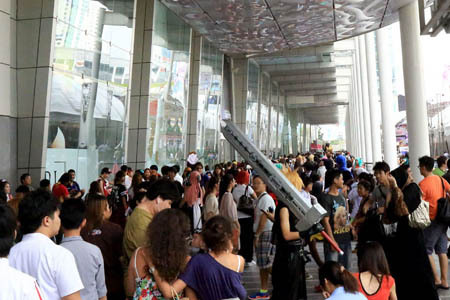 Now, welcome to the giant shopping center, Central World ! 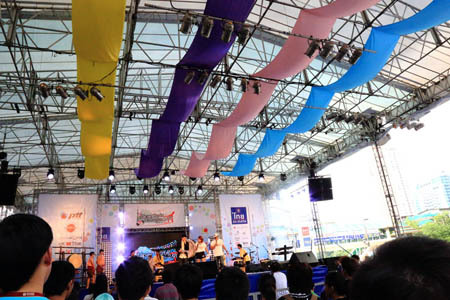 The picture above was taken when Japan Festa in Bangkok 2013 was held. Very crowded in the square in front of the department buildings. The appearance is like this. 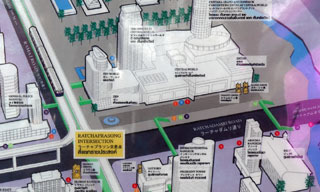 You'll see ZEN department store on the left. One shot of inside, just showing a part of it. The appearance is like this. You'll see ZEN department store on the left. One shot of inside, just showing a part of it. Is this just getting in ZEN from the side of Skytrain station ... ? 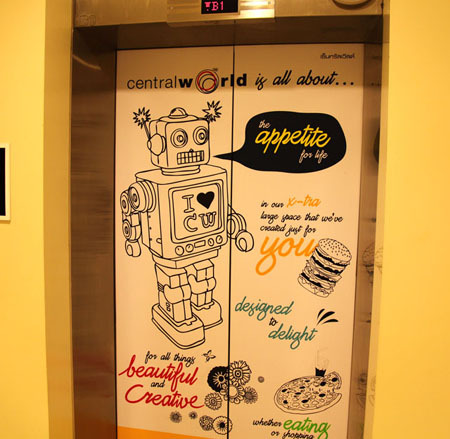 A door of an elevator. The design is very cool. Is this just getting in ZEN from the side of Skytrain station ... ? A door of an elevator. The design is very cool. MOS BURGER, Japanese Fine Burger and Coffee. A huge head standing out in front of the building is a woman of India. 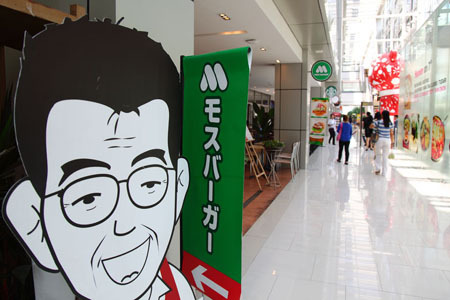 MOS BURGER, Japanese Fine Burger and Coffee. 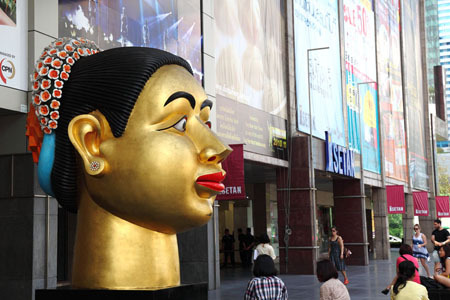 A huge head standing out in front of the building is a woman of India. Why is this kind of statue here ? 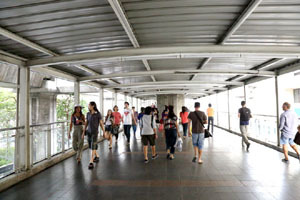 The pedestrian way connecting CentralWorld, Siam station and Chid rom station. 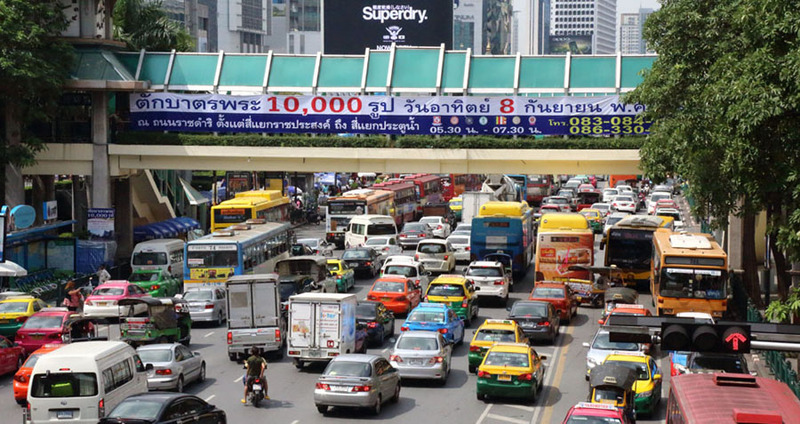 The most powerful power spot in Thailand is across a intersection. 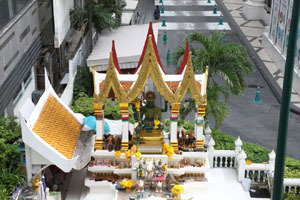 A little away from ERAWAN SHRINE is INDRA SHRINE, the God of a thousand eyes. Wow, so many cars. Very crowded ! 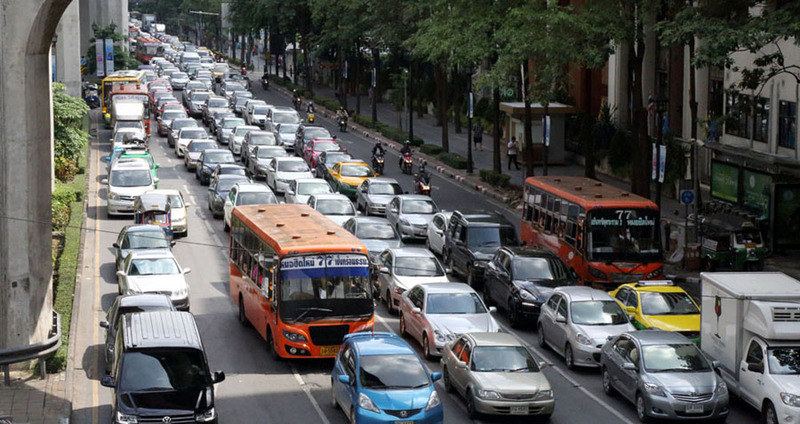 The street is stack with cars, buses, taxies and Tuktuks. 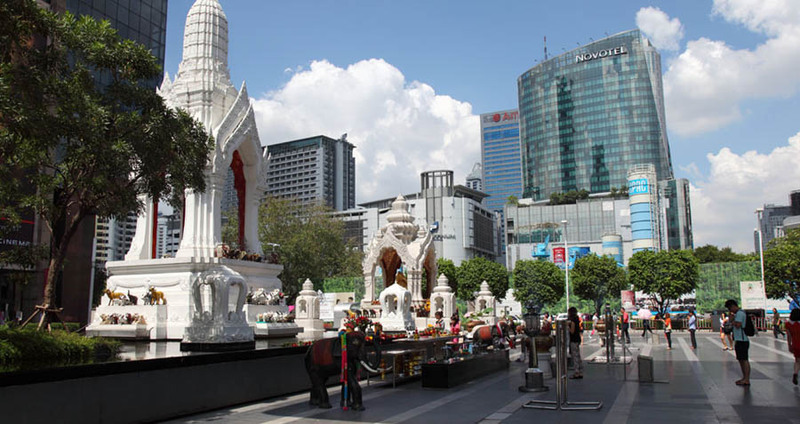 The Power Spots in front of ISETAN, TRIMURTI SHRINE - the God of Love and GANESHA SHRINE - the Elephant God of wisdom and education and remover of obstacles. 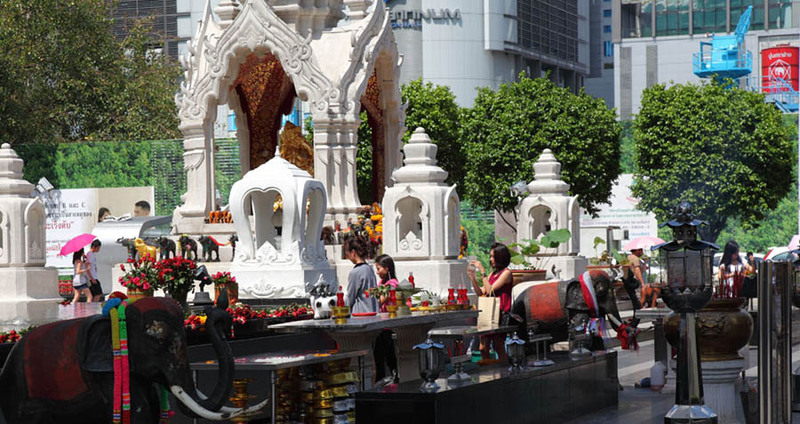 The Power Spots in front of ISETAN at Central World, TRIMURTI SHRINE - the God of Love and GANESHA SHRINE - the Elephant God of wisdom, education and remover of obstacles. The bigger shrine on the left is TRIMURTI shrine. Trimurti made up of the three Hindu gods, Brahma(the creator), Vishnu(the preserver) and Shiva(the destroyer), is the God of Love. The smaller shrine around the center of the picture is Ganesha shrine, the Elephant God. 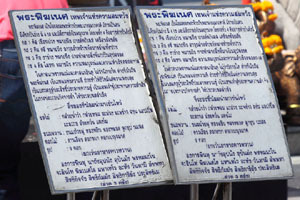 Thailand is a Buddhist country but you'll see Hindu Gods here and there especially Ganesha often. Very curious. 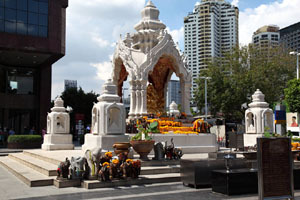 (About Ganesha: see Wat Samanratanaram famous for Thailand's largest reclining Ganesha. 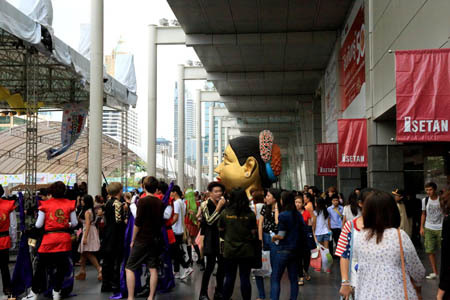 If you visit around Central World, don't forget to drop by this Power Spots ! The elephant-headed deity - the Hindu god of wisdom, education and remover of obstacles. 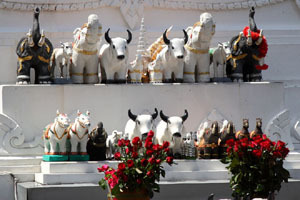 Decorations in front of TRIMURTI SHRINE. Elephants, buffalos and so on. A lot ! This shows in front of TRIMURTI SHRINE, if my memory is correct. Chants for praying ? Decorations in front of TRIMURTI SHRINE. Elephants, buffalos and so on. A lot ! Chants ? You see some people are praying. Very busy street with a lot of cars. 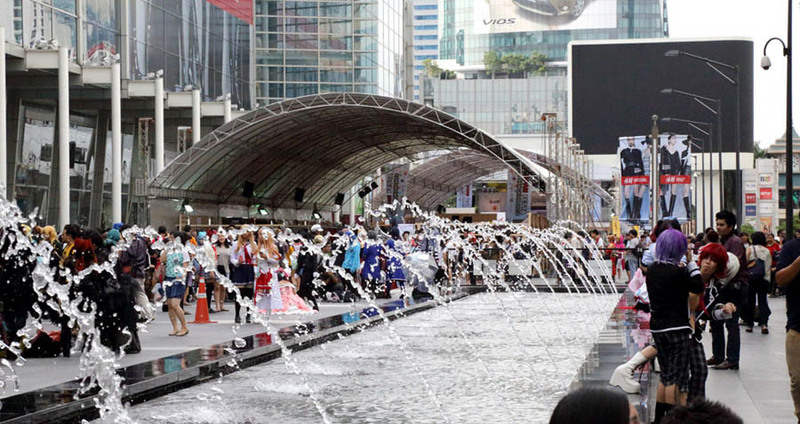 CentralWorld - Japan Festa in Bangkok 2013 ! 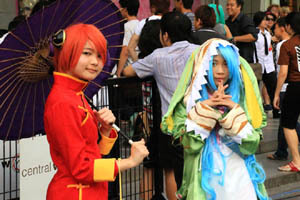 Welcome to Japan Festa in Bangkok 2013 ! 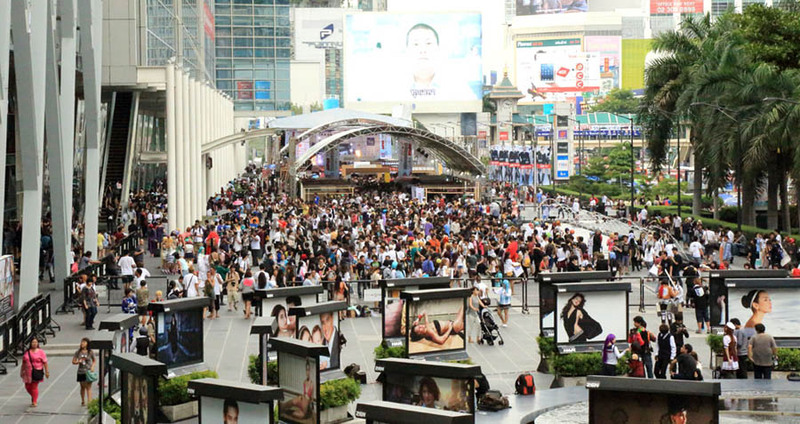 Held in the Central World square in front of the buildings. Really packed ! 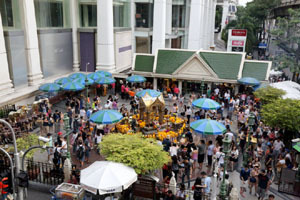 This festa, 9th time this year, was held from 31 in Aug. to 1st in Sept. in the Central World square in front of the buildings. 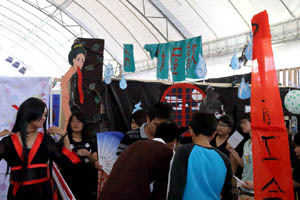 This event attracted a lot of local people who love Japan. See ? The site was really packed ! So many visitors around the woman of India statue. Wow, can not walk through easily. Everyone, have fun ! There are two venues like this. 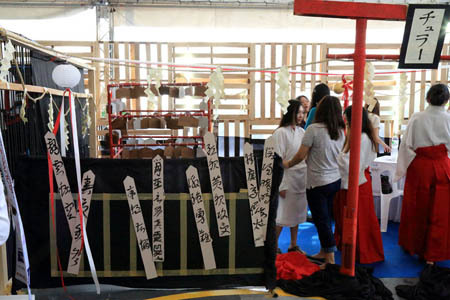 One of the venues with an arched roof had a big stage and showed a dance performance, and a lot of shops were opened in another venue by students who, I guess, studied Japanese in universities. 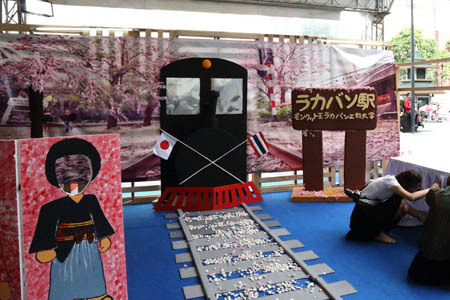 Sakura (cherry blossoms) and a locomotive booth by King Mongkut's Institute of Technology Ladkrabang of Thailand on the left. 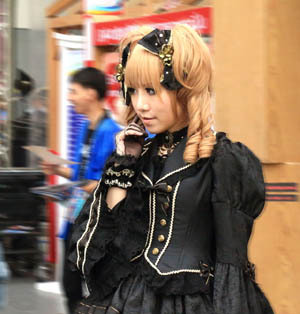 A woman posing as a Japanese candy GLIKO's mark by Thammasat University in Thailand. 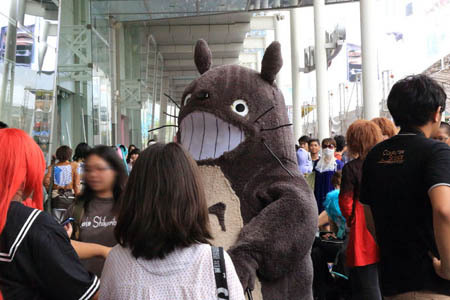 A coin throwing game with Totoro, the cartoon character of the popular movie, "Tonari no Totoro" or "My Neighbor Totoro". If you throw a coin and dropped it around his belly, you can get some gift. I tried once (about ten coins) but couldn't at all. 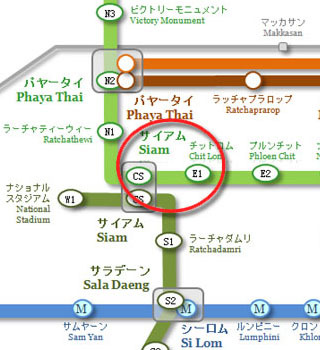 :D By Rangsit University in Thailand. 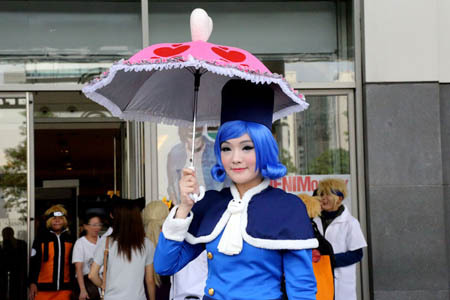 On the left, a woman posing as a Japanese candy GLIKO's mark by Thammasat University in Thailand. 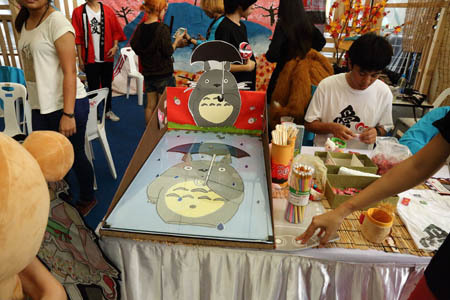 On the right, a coin throwing game with Totoro, the cartoon character of the popular movie, "Tonari no Totoro" or "My Neighbor Totoro". If you throw a coin and dropped it around his belly, you can get some gift. I tried once (about ten coins) but couldn't at all. :D By Rangsit University in Thailand. I'd never imagined I would see Rokuro-kubi in Thailand, long-necked monsters in Japan. By Thai Chamber of Commerce ? A restaurant under the roof. 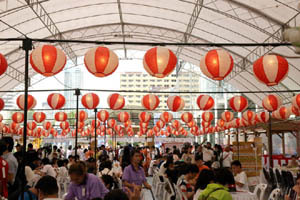 It shows a very good atmosphere of a Japanese festival with a lot of Japanese lanterns. 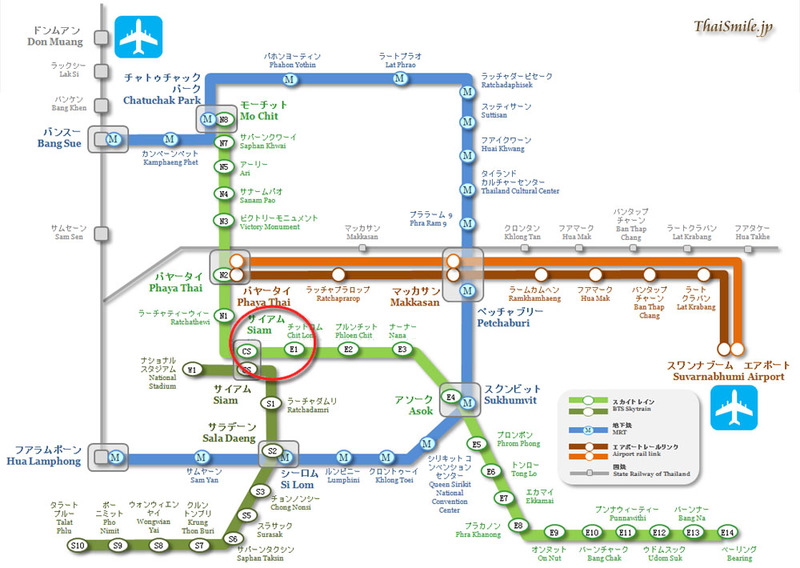 When I went back, the Skytrain station nearby was very crowded because of this Japan Festa. I'd never imagined I would see Rokuro-kubi in Thailand, long-necked monsters in Japan. By Thai Chamber of Commerce ? Hungry ! 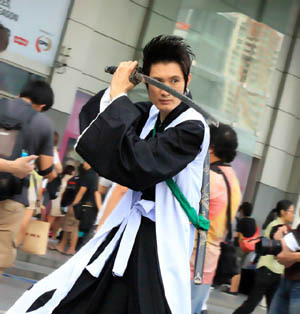 You would see soooo many cosplayers here and there in this event ! 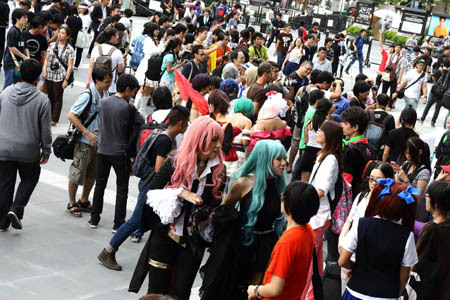 It was a little funny because I'd never seen a lot of cosplayers at once like this and it made me feel that they thought showing a lot of cosplayers was the Japanese culture. 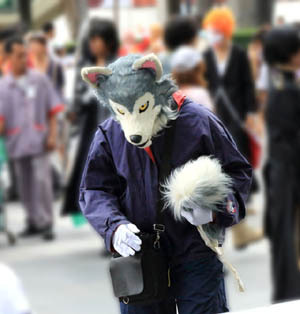 Maybe there was a cosplayer event in this festa, I guessed. They showed their favorite poses for you when you tried to take pictures of them. Cool ! 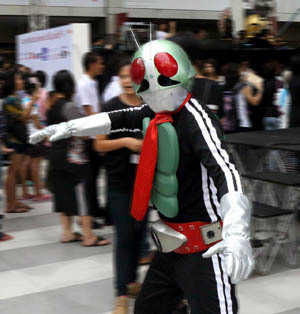 Personally, I was happy with Kamen Rider, one of the famous Japanese TV hero among kids, created in 1970's. 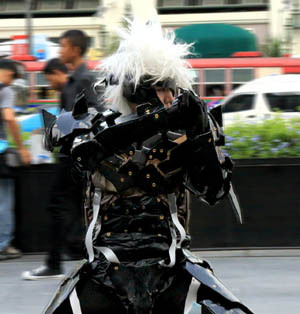 This is the first Kamen Rider because he has two lines on the side of his body. 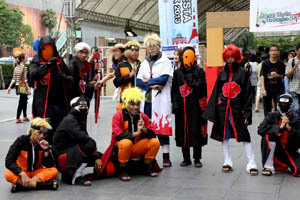 You'll see cosplayers in the event below. They are only some examples. Do you know what they are ? 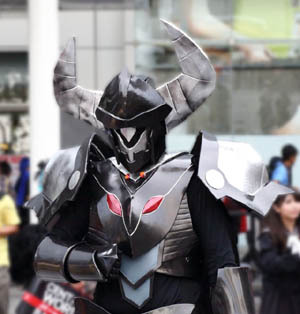 The first Kamen Rider ! Cosplayer photo sessions here and there. 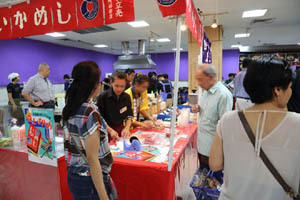 Hokkaido Fair was held in ISETAN at CentralWorld. 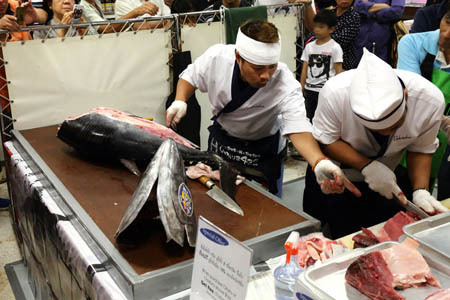 They had a tuna cutting show that we wanted to see in Japan someday. My wife was sooooooo excited. :D Very crowded. 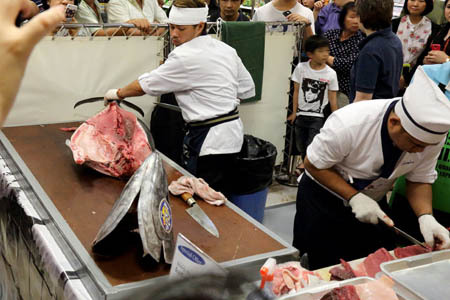 Wow, they brought the big tunas from Japan for this event. Thank you. A lot of people tried to take pictures of this show. This view was very curious to me as well. Cash desk here. Buy a lot ! Miso (bean paste) and dressings ... ? 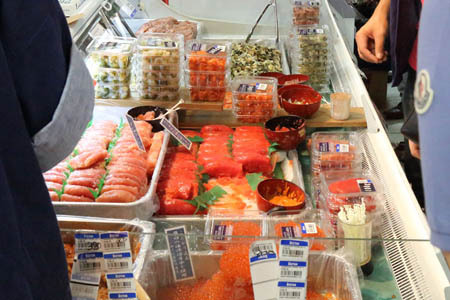 Sea products such as salmon caviar and salted cod roe . Looks yummy ! 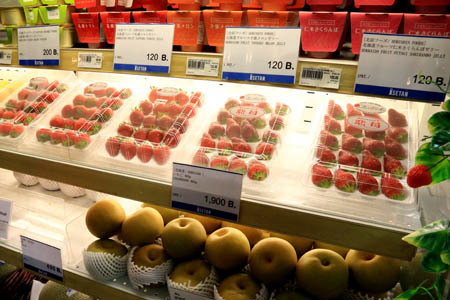 A peach was 1,000 yen or 10 dollars. Cry,... See food ! 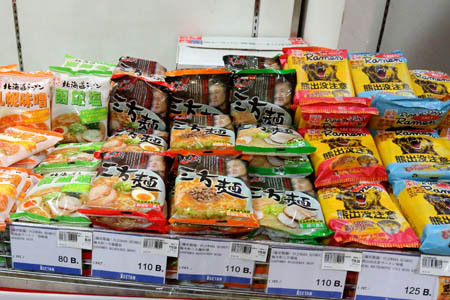 Various Hokkaido instant ramens. I didn't know that but they have a ramen named "Caution - Bears !". That's Hokkaido ! 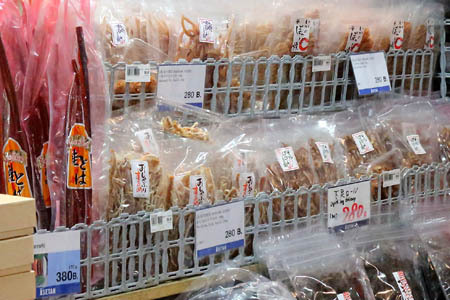 Dried see food such as dried squid and dried salmon. 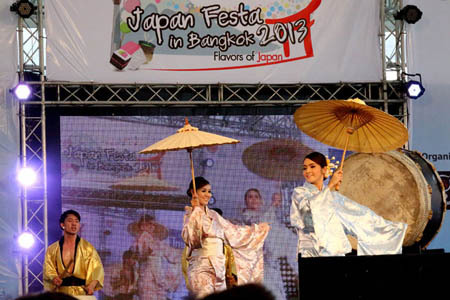 The Japan Festa in Bangkok is held every year and this year, 2013, was 9th time.